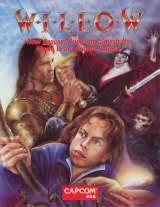 Arcade Video Game published 30 years ago by Capcom USA, Inc.
Willow © 1989 Capcom USA, Incorporated. Export release. Game developed in Japan. For more information about the game itself, see the original Japanese release entry; "Willow [B-Board 88622B-3]". There is an incorect Japan 'warning' on the first USA releases. Capcom USA soon removed this warning by releasing a new proper revision.